Thermo mechanical controlled processing (TMCP) is a technique designed to improve the mechanical properties of materials by controlling the hot-deformation process in a rolling mill. This was originally designed to produce the required external shape of the product. Controlled rolling, controlled-cooling and direct-quenching are typical examples of thermo mechanical controlled processing. Such processing saves energy in the manufacture of steel by minimizing or even eliminating the heat treatment after hot-deformation, thus increasing the productivity for high grade steels. It normally requires a change in alloy design and often reduces the productivity of the hot deformation process itself, but at the same time makes it possible to reduce the total amount of alloying additions and to improve weldability, whilst sometimes producing new and beneficial characteristics in the steel. TMCP process has several advantages that can help overcome issues related to the addition of major alloying elements and conventional heat treatments. TMCP steels with added micro alloys have been developed to manage the conflicting requirements of strength, toughness and weldability through grain refinement. TMCP effectively enables a reduction of the preheating temperature, thus lowering the rolling cost. As TMCP steels afford good weldability, they are highly valued in industries such as shipbuilding, offshore structures, pipelines and building construction. TMCP is the sophisticated combination of well-defined deformation operations and well-defined heat treatment in a single production stage to control the microstructure of the steel being rolled. TMCP produces steels with the desired external qualities (dimensions, shape and surface quality) and acceptable mechanical properties. TMCP is normally considered as the final stage in the production of steels. TMCP is generally associated with hot rolling operations in hot strip mills, plate mills and bar and rod mills. For example, in case of production of hot strip of low carbon steel grades in a hot strip mill, various parameters of controlled rolling in the finishing train with respect to temperature, rolling speed, rolling reductions and run-out cooling pattern are carefully selected to produce the desired mechanical properties of the hot strip. Traditionally, the focus of such TMCP has been on metallurgical aspects of producing the microstructure which provides the desired mechanical properties after hot rolling. The aspects of exterior quality such as shape and flatness, gauge consistency, surface quality, etc., have received much less attention although they are closely related to product metallurgy and processing practices. The first introduction of thermo mechanical processing into commercial production was controlled rolling of carbon (C)-manganese (Mn) steel plates of 40 kgf/sq mm grade for shipbuilding in the 1950s. After 1945, the concept of toughness as distinct from the concept of ductility, and notch toughness became a requirement for shipbuilding and other structural steel plates. In the 1950s, an increase in the Mn/C ratio, deoxidization by the addition of aluminum (Al) and the normalizing of Al killed steels were all adopted to improve notch toughness. At that time, the concept that the ductile to brittle transition temperature can be reduced by refinement of ferrite (alpha) grain size was also established. From the early 1960s, an extensive volume of research was conducted into the effects of rolling temperature on mechanical properties. From this research, a rolling procedure at a controlled temperature was developed to refine the grain size. Controlled rolling made a major contribution to the reduction in alloy addition and the improvement of weldability. This development led to the production of substantial amounts of strong and tough steels, mainly used for pipelines. Although controlled rolling resulted into relatively low productivity, it could be performed at a comparatively low temperature to obtain enhanced levels of strength and toughness. As the controlled rolling process is based on grain refinement, it can improve yield strength and toughness, but cannot improve tensile strength without alloying. Hence there has been limited improvement of weldability with this process. The present approach of using water-cooled TMCP, which gives accelerated cooling after low- temperature rolling and direct quenching, has been greatly improved in the 1980s. The continuous online control process covers a wide range of cooling parameters (i.e. heat transfer coefficient) and austenite conditions (i.e. unworked, recrystallized or non-recrystallized) and yields a variety of steel properties. Several concepts are employed in the cooling equipment. In one of the most sophisticated present configurations, the plate is flattened by a leveler before water cooling. This procedure is effective across a wide range of cooling rates for achieving uniform cooling throughout the plate plane and for realizing homogeneous mechanical properties. There are several processes for TMCP. These processes broadly fall into the following three main categories. Controlled rolling down from the normalizing temperature which is still fully austenitic (above the Ar3 temperature) followed by a rapid cool of approximately 10 deg C/sec. The aim of this process is to refine the grain size by controlled rolling and to increase the strength by suppressing the formation of ferrite and pearlite in favour of a strong tough bainite. Controlled rolling both above the Ar3 and below that temperature, in the austenite ferrite mixed region. In addition to austenite grain refinement, the recrystallized grains are flattened and nucleation of fine ferrite is encouraged by the deformation. At a temperature above the Ar1, the controlled rolling is interrupted, and followed by rapid cooling to room temperature or an intermediate temperature. Controlled rolling is performed as part of a preliminary processing, followed by cooling and reheating to just above the Ar3 temperature and then rapid cooling to well below the Ar1 temperature. The purpose of this technique is to develop the finest equiaxed austenite grain size before the controlled cooling begins. By appropriate choice of deformation temperature and strain rate, the strength of steel can be increased. The strength of TMCP steel is higher than for normalized steel of the same composition. Thus TMCP steel has a leaner composition (lower alloy content) than conventional normalized steel of the same strength. The concept of microstructural control by TMCP is schematically presented in Fig 1. Whereas TMCP achieves high strength by utilizing the transformation to ferrite and bainite in addition to enhanced toughness, controlled rolling technology enhances toughness mainly by refinement of the ferrite microstructure. Accelerated cooling gives higher productivity compared with inter critical (austenite + ferrite region) rolling and minimizes any decrease in absorbed energy through the separation phenomena. TMCP consists of two stages in series namely (i) controlled rolling and (ii) a subsequent accelerated cooling process. During the rolling stage, the austenite grains are elongated into a pancake shape, which introduces crystallographic discontinuities such as ledges and deformation bands. These ledges and deformation bands remain until accelerated cooling starts when the rolling temperature is sufficiently low (less than 800 deg C). Recrystallization takes place when the temperature is sufficiently high (more than 900 deg C) and most of the ledges and deformation bands induced by deformation disappear. The retaining deformation ledges and bands can act as potential heterogeneous nucleation sites for the austenite to ferrite transformations and contribute to grain refinement. Also the heterogeneous deformation of austenite increases the grain surface area and the length of grain edges per unit volume, while there is no change in the number of grain corners per unit volume. The additional feature of TMCP is its cooling process. 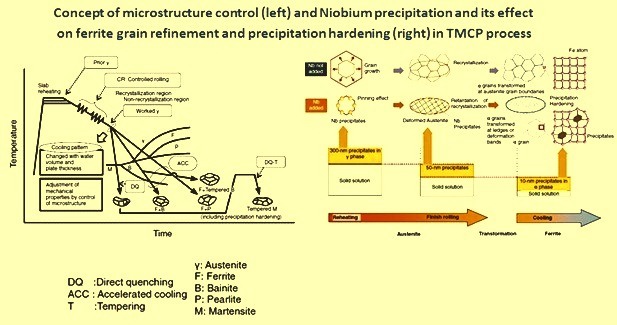 During the accelerated cooling the growth of transformed products is effectively suppressed and grain refinement is achieved by transformations where the above mentioned nucleation sites are introduced. The decrease in the transformation temperature caused by accelerated cooling induces strong changes in the intra-granular structure. The transformation driving forces also contribute to refinement of the grain size through low temperature rolling followed by quenching with water. The tensile strength can be widely controlled (from 50 kg/sq mm to above 80 kg/sq mm). The micro alloying elements in the steel control the microstructure. Trace amounts of elements such as niobium (Nb) and titanium (Ti) (concentrations of the order of 0.01 %) allow the microstructure to be refined from the reheating of steel to controlled rolling and accelerated cooling processes and enhance the strength of the finished rolled product. The effects of Nb (Fig 1) as an example of a micro alloying element show that the sizes of the Nb precipitates formed during each process are roughly 300 nm at the slab reheating temperature before rolling (more than 1000 deg C), 50 nm during controlled rolling (around 800 deg C) and 10 nm at the transformation temperature (around 600 deg C) during cooling. In short, the size of precipitates decreases with decrease in the temperature as the process progresses. This is useful for microstructural control. It is therefore necessary to maintain Nb in a solid solution so that it can be precipitated in sufficient amounts in the subsequent processes. Nb precipitates during the reheating of steel and prevents austenite grain growth via the pinning effect. During the subsequent rolling process, at below the recrystallization temperature (around 900 deg C), the driving force generated by the strain energy introduced by such rolling facilitates the precipitation of fine Nb carbides and/or nitrides. These fine precipitates prevent austenite grain recrystallization and therefore coarsening. During thermo mechanical rolling, the strain induced precipitation of micro alloying elements such as Nb plays an important part in controlling the microstructure. Nb delays the onset of austenite recrystallization. Because of the non-recrystallized nature of austenite, there is a plentiful supply of heterogeneous ferrite nucleation sites (ledges and deformation bands) for the subsequent cooling process. Nb also induces other effects such as during the austenite to ferrite transformation upon cooling it precipitates in the ferrite matrix and enhances its strength via the precipitation strengthening mechanism. The crystal structure of the precipitates does not fit well in the ferrite lattice and this incoherency between the ferrite and precipitates results in increased strength. The TMCP parameters affect the microstructure and properties of Nb-Ti micro alloyed steel. For example, the yield and tensile strength increase with a decrease in the finishing-cooling or non-recrystallization rolling temperature. The most notable effect of TMCP is that steel with the same strength as conventional steels can be manufactured with a lower carbon equivalent (i.e. with lower alloy addition) through microstructural control. It has been demonstrated that the value of Ceq required for TMCP steel to attain the same strength is 0.04 % to 0.08 % lower than that required for normalized steel. As a result, weldability (i.e. the preheating temperature required to prevent cold cracking at HAZ) has been significantly improved in TMCP steels. TMCP thus increases productivity during the fabrication of steel structures while enhancing safety and reliability. For TMCP, several types of accelerated cooling equipment have been suggested and put to practical use since 1980. The necessary points in this development have been the uniformity and controllability of the cooling temperature and the plate flatness after cooling, as well as the productivity of the process. Frequently used accelerated cooling equipment has been thoroughly reviewed for this purpose. Each steel plant adds specific features related to the cooling method, installation location and the motion of the strip/plate. Presently, accelerated cooling equipment is commonly of the continuous type, in which the cooling zone is divided in the traveling direction of the strip/plate. In this setup, water cooling of the top and bottom faces of the strip/plate can be independently controlled in each zone. In addition to homogeneous water cooling, progress has been made in reduced-distortion cooling technology, which requires even more sophisticated cooling control. This is needed to ensure both the uniformity of the cooling temperature and the required strip/plate flatness after cooling. The issues related to strip/plate distortion (deflections) are classified into three major types depending on the direction in which uneven cooling occurred, i.e., along the thickness, longitudinal and transverse directions. On the basis of thermal stress and elastic instability theory, the expressions for the critical buckling along these three directions resulting from uneven cooling are found. One of the causes of plate distortion is the inevitable overcooling on the four narrow faces of the plate. To avoid this temperature decrease, several mechanistic measures are generally taken such as a water crown profile can be applied in the transverse direction, edge screening, which reduces the water flow along the edges, can be applied in the width direction, and head and tail screening can be applied to prevent overcooling at the respective narrow faces. To minimize the temperature difference, optimization of the nozzle arrangement at the bottom face has also been examined, since another mechanism that causes distortion is the different thermal histories of the top and bottom faces of the strip/plate. At some steel plants, learning functions are employed so that the ratio of water volume applied to the top and bottom faces can be automatically controlled on the basis of the accumulated data on temperature and flatness. The flatness of the strip/plate before cooling is essential for ensuring a uniform cooling temperature. This is consistent with the recent trend of optimizing the sequential equipment configuration by installing a hot leveler before the accelerated cooling stage. Additional technologies have been required to meet the increasing demand for TMCP since the 1990s. A key issue in such technologies has been to achieve highly uniform cooling to minimize steel strain, which occasionally occurred with conventional TMCP methods and had to be rectified to reduce the amount of releveling. Product quality requirements have also become more severe and steels are required to have less variation in their strength. This is achieved through improved accuracy of the cooling finishing temperature during accelerated cooling. To respond to these requirements, some novel TMCP technologies, such as CLC-? and Super OLAC, have been developed and are now in used in production. One of the improved cooling equipment systems, CLC-?, has been developed and introduced for commercial use by Nippon Steel Corporation (NSC). This system is a technical breakthrough for TMCP. Owing to its unique cooling technology, as well as the facility layout, a wide range of cooling rates and patterns and uniform cooling characteristics are realized over the entire strip/plate. NSC conducted experiments and numerical analyses on thermal conductivity engineering and fluid dynamics and overcame the heterogeneity of the cooling behaviour, which was not unavoidable using conventional cooling equipment. They developed a new water-cooling system with a wide range of cooling abilities, which reduced the temperature variation to approximately half that of conventional equipment. This new generation of controlled cooling technology is now widely applied to actual products, enabling the resolution of conflicting property requirements such as strength and toughness. The above-described measures have improved the uniformity of cooling temperature and plate flatness after cooling compared with past TMCP applications. However, the increasingly strict requirements for steel flatness necessitate further modifications of the accelerated cooling equipment and control measures to ensure flatness after cooling. To achieve this, some steel plants have recently taken measures such as installing heavy cold levelers.